As if things weren’t tough enough with cold water, we received a hair over 3 inches of rain on late 28 Jan and all day on 29 Jan. This rain spanned over the watersheds for Stillhouse, Belton, and Georgetown. Stillhouse has risen over 8.3 feet and is still rising. Belton has risen over 10 feet and is still rising. Georgetown has risen over 8.5 feet and is still rising. I’ve postponed all scheduled trips through Friday, 05 Feb. and will take a hard look at things at that time after attempting to find fish in this new set of conditions. I fished a half-day morning trip on Belton today with returning guest Mr. Garland W., a retired architect, from Tyler, TX. Garland and his wife do a 5 week long RV road trip each year to different Texas lakes, culminating at Belton. We stacked the deck on this trip by waiting on good fishing weather. Fortunately Garland’s schedule and mine allowed us to look at the 5-6 day forecast and pinpoint the best time to be on the water. We passed on Mon. and Tue. as they were both, bright, calm days. Wednesday’s weather was pre-frontal SE winds, with warm air temperatures, a building breeze, and heavy cloud cover — just perfect! With pre-frontal SE winds bringing cloud cover, warmth, and water movement in before a big cold front, the fish went on a 2 1/2 hour spree pursuing shad from top to bottom, and especially in the 27-34 foot band. As we got underway, the breeze had not yet kicked in and things were predictably slow until around 9:45. I commented to Garland as we fished over one particular area that “this place is going to light up if we get some wind in here.” We saw ample bait over 24-32 feet of water, and gamefish mixed in among the bait, but the fish were simply turned off and would only half-heartedly follow even our mostly lightly finnessed presentations. Finally, around 9:20, we got a ripple pushed by a SSE breeze which quickly built to a 12-13 mph push. We motored back to the area where the bait and fish had shown clearly earlier in the morning and, beginning at Area 593 (BA: 45G) we began to show active fish on sonar both on bottom and suspended. For 2 hours and 45 minutes these fish remained active to some degree, but the first 30 minutes was by far the stongest feed. The area over which we found active fish was quite expansive, spreading from Area 593 to Area 594 to Area 031, to Area 591, and to Area 592. Regardless of where the fish were located, the most active fish tended to be positioned between 27 and 34 feet, regardless of whether that depth range happened to be at bottom, or suspended over 40 to 50+ feet. Our approach was to simply slab for bottom-oriented fish with a bit of an extra pause between jigging strokes when fish were apparent on sonar. For suspended fish seen earlier in this feed, we were able to “smoke” those same slabs at a healthy pace and catch them. Later, as the feed began to wane, we reverted to “sniping” to pick off the few remaining active fish amidst a greater population of of inactive fish. For our efforts today, we landed 66 fish including 1 drum, 9 hybrid stripers of which 4 were of legal size, and 56 white bass. Most of these white bass were right at 12 to 12.75 inches in length, with only 4 falling beneath the 10 inch mark. We wrapped up our trip around 12:35p as we realized the feed had ended. We knew we could continue to “snipe” addtional fish, but also knew that’d be anti-climactic after the spree we’d just witnessed. We contemplated a trip the following day, but the forecast called for near 100% chances of rain with lightning, so, we agreed to just do it again next year as I bid Garland safe travels back home. One observation I made today was that despite the cold water, right at the beginning of the feed, hybrid were regularly making it to the surface and pinning large shad against it; I also noted that all of our hybrid were taken higher in the water column than the average white bass was, and that the hybrid appeared solo (not in schools) on sonar. Not a single hybrid was slabbed off bottom today. I fished a quick morning outing accompanied by my mom, Charlotte. We knew going into this that things would be slow as the skies were clear, the water cold, and the very light winds from the NNW. I wanted to use this trip to take someone (my mom) totally unfamiliar with both sonar interpretaion and my “sniping” technique and get them from “0 to 60” over the span of the trip. Winds: Calm at trip’s start, beginning NNE at 3-4 around 9:00, tapering up to 8-9 and nearly due N by trip’s end. Because I’ve only recently refined this technique, I knew I needed to improve my presentation of it for my guests’ sake. Being able to take something complex and explain it clearly and quickly is trickier that one might think. As we worked together on this, we began looking over a stretch of river channel about 70 feet in length that clearly held a lot of bait. At this particular area (Area 303), the channel, which is oriented SW to NE, bottoms out in over 50 feet. On the old W. bank, it forms a “stairstep” with the first landing occurring right around 43 feet, and the second occurring right around 34 feet. This morning we found very sluggish gamefish on the bottom on the deeper of the two landings. I talked my mom through both jigging and sniping and differentiated for her when each would be most effective. We fished a total of 3 1/2 hours finding fish here and at Area 590, and catching a total of 15 fish including 14 legal white bass and a short crappie. Mom was very happy to have caught those, but I was most interested in her “debriefing” comments following the trip. As I reviewed with her our day, she brought out some real food for thought for me. The first thing I realized I need to do when it is likely that “sniping” will be employed on a particular trip, is to show my guests, right at dockside, the sonar display and all of the components of it, so that when we see fish targets and our lures, they can appreciate the relative positions of those objects, as well as the always-present bottom marks and surface clutter. The next thing I realized I need to address is retrieve speed. When I simply say “go slow”, that means nothing to a guest unless I’ve “calibrated” my guest to what “go slow” looks and feels like on sonar and in the rod tip, respectively. I have already worked through all of these things with the slabbing, easing, and smoking tactics that I’ve used for years, but, with this new technique, we made some progress today and, no doubt, will continue to refine it as the water looks like it’s going to be cold for a good while longer. I fished a half day trip today with Mr. Mike R. and Mr. Gene E. These gentlemen serve our community as the Patrol Commander and Chief of Police for the City of Belton. I was glad to have both aboard as they were both very decent men, eager learners, and were both persistent and hardy, given some tough fishing conditions. 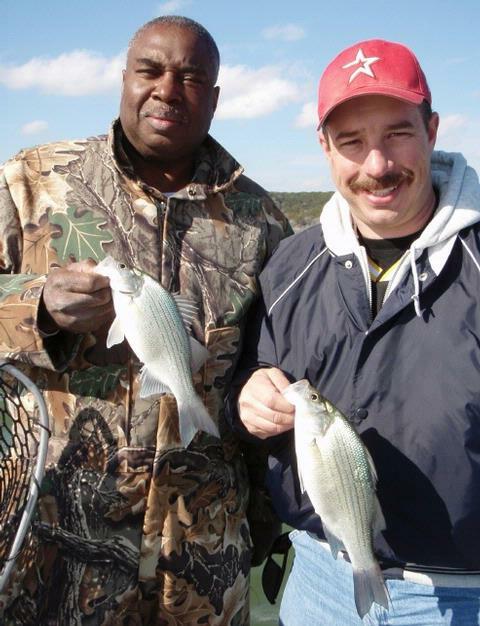 Mike and Gene toughed it out today for some deepwater jigging and sniping on Belton Lake white bass. Air Temp: 50F at trip’s start. Wind: S the entire day beginning around 6mph, then building to 16+ by 11:30am, then tapering back to around 10 by sunset. Skies: Grey, low clouds persisted until around 11:30, then gradual clearing occured leaving behind fair skies with 10% cloud cover. We found fish in two general locations today. In the morning, through 11:00a, we worked a very loose congregation of fish located between Areas 580 and 583. These fish were very lethargic, suspended, and finicky. 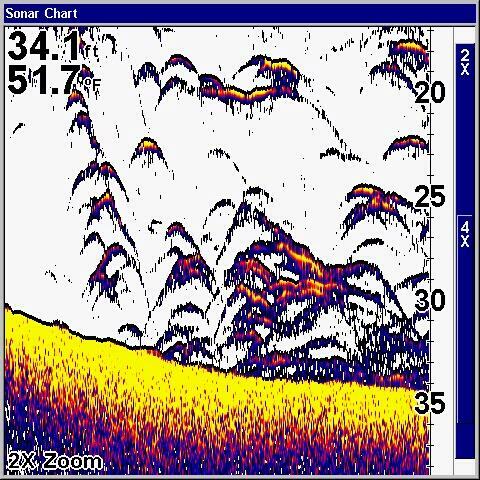 Most fish we encountered were spotted on sonar at between 18 and 39 feet deep over 40 to 53 feet of water. We were able to entice 1 in every 10 to 12 fish we spotted into striking, and landed about 3 of every 5 striking fish. We finished up in this area with 15 fish landed in nearly 4 hours of fishing including 3 crappie, 1 largemouth, 2 juvenile hybrid, and 9 white bass. These fish were taken primarily with a sniping technique. All crappie came off bottom with the lures kept down low as we searched for suspended fish. We made a run to the north of Area 561 (BA: 30T) and found whites feeding aggressively, but only for a short span of time. While they fed hard, they came up on the lip of the breakline here in 32-36 feet. As the feed subsided, they slipped back into 40+ feet of water and suspended. Occasional bursts of bird activity gave us just enough hints to keep up with the more active fish. We took our tally from 15 fish caught in 4 hours, up to 39 fish caught in 7 hours. The first 17 fish we caught in this area came on slabs worked traditionally on bottom. The last 7 fish came via a sniping technique. By 2:30p my guests needed to head in, and the action had all but subsided. After parting ways, I met fishing acquaintances Rodney T.and Roy P., and Roy’s son-in-law, at the ramp. They were just planning to launch, so I offered to show them where we’d just enjoyed our success. Rodney and I fished out of my boat and Roy and Bobby fished out of Roy’s rig. We headed back to the scene of the midday feed, but the fish were shut down pretty hard. Rodney and I jigged for 6 more fish in about 2 hours’ time, including 5 whites and 1 small blue cat. It was nice to know after finishing up the day that my guests Mike and Gene had seen the best action the day had to offer, and that to have fished any longer would have yielded little more for them. With a trip scheduled for Monday, I wanted to refine the sniping technique that paid off so well at Belton earlier this week. Today presented some of the toughest conditions in wintertime fishing — a damp north wind. Regardless, I caught fish wherever I could find fish on this technique. So, despite the poor fishing (which was expected given the weather) my confidence in the technique was bolstered after seeing how these turned-off fish perked up and responded. Air Temp: 44F at trip’s start. Wind: N at ~13 the entire trip. Skies: Grey cloud cover until 10:15, then slowly clearing from NW to SE. My goal today was to refine the “sniping” technique that I found would tempt even lethargic white bass. As I used this at Belton earlier in the week, I used ultralight gear with very light 6 pound line. I wanted to rig up with standard medium tackle today so that clients not familiar with fishing by sight (as is required with the very soft action on the UL equipment) would be able to feel bites transmitted in the more sensitive graphite of the traditional tackle. I worked up a good combination of rods, reels, and lures and also figured out a way to keep the ice jigs from creating such a twist in the line. By the time I came off the water I was sure I could hand a rod to a guest and expect they could catch fish right along side me. I found fish in 3 locations today. There was a bit of shallower action early on between Areas 375 and 390 right on bottom yielding just two white bass. The loons have gotten so common on Stillhouse that the birds have really been ignoring bait pushed by fish and are instead keying on bait pushed by loons. So, the presence of gulls and terns now rarely indicates the presence of gamefish. These loons are definitely on bait, but the bait covers a much wider area than any gamefish keying on them are typically schooled up in, so, there is still a lot of looking left to do with sonar even where b. The second location was Area 590 in 49-53 feet of water. There were white bass here found solo and in groups of just 2-3 fish. I was able to temple 1 in 4 and caught 2 of every 3 that started at the bait. I landed 7 white bass here, all right at 11 inches. The third location was Area 569 in 52 feet of water. There were white bass both on bottom here, as well as suspended as high as 18-20 feet, but more typically around 38-42 feet. Again,I was able to temple 1 in 4 and caught 2 of every 3 that started at the bait. I landed 5 fish here including 1 largemouth and 2 short whites off the bottom, and 2 whites suspended. The key today was going deep and slow — I never fished shallower than 43 feet today and used ultralight gear to sense the very light bite of the very lethargic white bass I located. 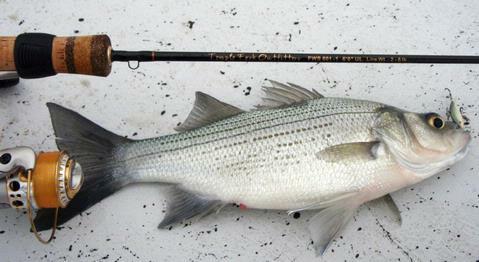 I experimented with a new 6′ ultralight rod presented to me by flyrod manufacturer Temple Fork Outfitter. The rod is made with a 3 weight flyrod blank. I coupled light 6 pound mono with an ice fishing jig and worked over schools of very stationary, lethargic white bass today with good success. Wind: SE the entire day at 5-9 until ~2:45p when winds went slack. Skies: Grey, heavy cloud cover dropping light mist and occasional light drops of precipitation through the dayr. Environmental Note: Spotted first flocks of robins on 12 Jan. In summary, I found fish bunched in two distinct locations today, both very similar to one another in that they were both 43-48′ deep and adjacent to even deeper water, with bait present. The first locale spanned from Area 587 through Area 588 to Area 589 (BA – 20 G/T). I didn’t get on the fish here very well, as I was still trying to figure them out. I tried every form of smoking, easing, and jigging, but the fish would not respond, despite being suspended in schools which is usually indicative of a willingness to feed. I then tried downrigging with both a small and moderate sized lure, but still nothing – the fish definitely spooked down and away from the ‘rigger. I noted that fish would not chase a moving lure, and often were spooked downward by one. I left this area scratching my head. At the second locale, spanning from Area 580 through Areas 581, 582, 583, 584, and 585 to Area 586 (BA – 45 G/T), I finally cracked the code. These fish responded well to a sniping technique, either used motionless (best for stationary, stacked fish) or with a slow upward movement (best for individual fish). The strikes were very, very light, often just being detected as a change in pressure, not a true strike. Bare fingers were a must to feel the line, and watching the rod tip was also a must. Although I fished until 5pm, all but 3 of these fish were caught by 2:40pm. It was at that time that the winds died and the fishing died with it. The breakdown on the catch was 2 crappie, 5 largemouth, 7 hybrid (4 legal), and 91 white bass. Just a note of thanks to all of you who stopped by my booth at the Boat Show this weekend! We had 18 kids sign up for free guided trips this coming season via the S.K.I.F.F. program. 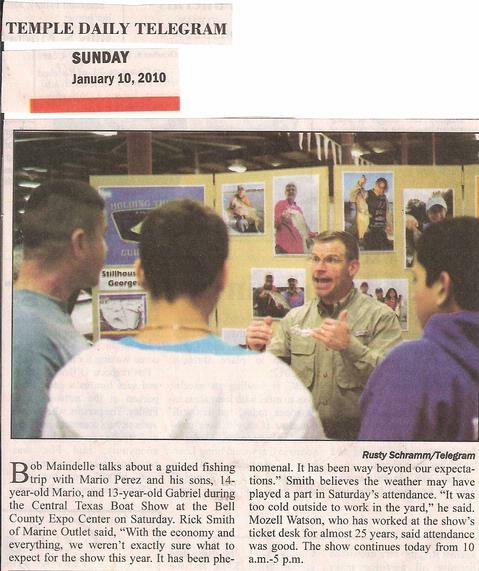 This program is for the children of deployed soldiers and is made possible by a grant from the Austin Fly Fishers.